It has been shown by Durand et al. (2013), Reul et al. (2013), Hasson et al. (2014) that SMOS detects large scale interrannual variability of SSS. The LOCEAN group check this again over 2010-2014. 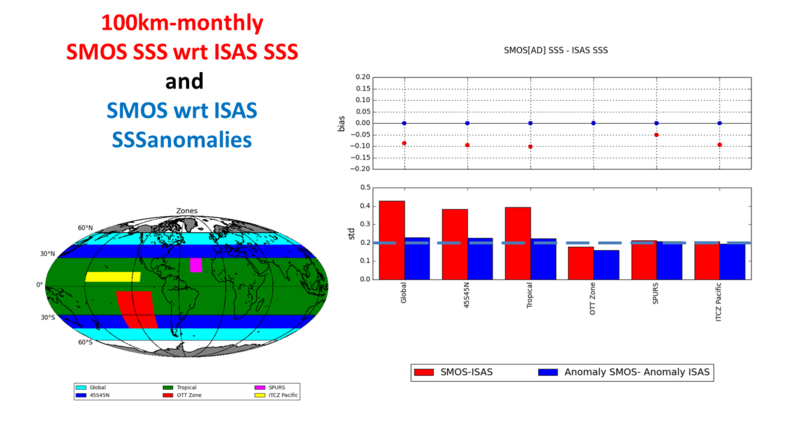 The monthly anomalies of SMOS SSS with respect to a SMOS SSS monthly climatology very well agree with SSS monthly anomalies derived from in situ SSS using the In Situ Analysis System (ISAS) optimal interpolation by F. Gaillard (LPO) and the Coriolis Center. By computing anomalies with respect to 4-year monthly means, SMOS SSS systematic biases are removed. This leads to rms differences between SMOS SSS monthly anomalies and ISAS SSS monthly anomalies the order of 0.2 over large regions, while rms difference of SMOS SSS minus ISAS SSS are on the order of 0.4 over large regions. Part of this rms difference is due to spatial structures at shorter scale than 300km not resolved by ISAS (Hernandez et al. 2014). Hence this result strongly suggests that SMOS has the potential of measuring SSS at monthly and 100x100km2 scale with a precision better than 0.2 (Hernandez et al. 2014 found 0.15 in the subtropical north Atlantic) provided that systematic biases are removed. This study has been performed with CATDS CEC-LOCEAN maps built using ESA version 5 reprocessed SSS. Systematic latitudinal biases present in version 5 are expected to decrease in version 6. Durand, F., G. Alory, R. Dussin, and N. Reul (2013), SMOS reveals the signature of Indian Ocean Dipole events, Ocean Dynamics, 63(11-12), 1203-1212. Hasson, A., T. Delcroix, J. Boutin, R. Dussin, and J. Ballabrera-Poy (2014), Analyzing the 2010–2011 La Niña signature in the tropical Pacific sea surface salinity using in situ data, SMOS observations, and a numerical simulation, Journal of Geophysical Research: Oceans, 119(6), 3855-3867, doi:10.1002/2013JC009388. Hernandez, O., J. Boutin, N. Kolodziejczyk, G. Reverdin, N. Martin, F. Gaillard, N. Reul, and J. L. Vergely (2014), SMOS salinity in the subtropical north Atlantic salinity maximum: 1. Comparison with Aquarius and in situ salinity, Journal of Geophysical Research: Oceans, in press. Reul, N., et al. (2013), Sea Surface Salinity Observations from Space with the SMOS Satellite: A New Means to Monitor the Marine Branch of the Water Cycle, Surv Geophys, 1-42.